What are the realizations that will transform a person’s attitude from selfishness to service? What is so powerful that it is considered by all major religions as among the greatest virtues that you can practice? In this talk Harry discusses the spiritual awakening and changes you can expect from your Avatar experience. He reflects on the realizations that begin as you move from self-awareness into the power of self-acceptance. He also reveals the secret to conserving natural resources. 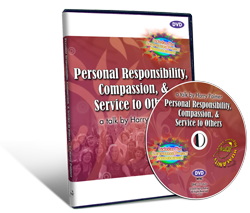 Harry explains how the qualities of personal responsibility, compassion, and service to others measure a society’s, or individual’s, move toward greater happiness. "Societies, particularly those under democratic rule, reflect and shape the general attitude of the individuals that participate in them. Societies that wish to flourish will place a high value on personal responsibility, compassion, and service to others. The prevalence of these three qualities, personal responsibility, compassion, and service to others, will indicate whether a society is expanding or contracting. The same indicators, of course, will tell you whether an individual or a group is on the rise or the decline. If you wish to improve a society, or a group, or an individual, you can do it by improving any one of these areas: personal responsibility, compassion, or the service they give to others. As these qualities grow, they nurture “we-attitudes”. We-attitudes are things like: we can build it, we can do it, and we can succeed. And they are typical of a group that is on the rise. A lack of these three qualities, personal responsibility, compassion, and service to others, results in self-centered “me-attitudes”: for example, I come first, I am going to win, give me some more. These are typical of a group or an individual who has grown selfish and is on the decline. Selfishness destroys groups. It’s an affliction of the mind."